Lately I’ve had many questions about getting started homeschooling. I admit, it is a very daunting choice. And, even if you already know you want to homeschool, deciding how to teach your children and what curriculum to use is overwhelming. We are so blessed to be homeschooling in this decade- it is becoming popular and there are many choices available. There are different styles to choose from: unschooling, school at home, unit based, character based, classical, Charlotte Mason, and more. Then on top of that, the curriculum choices are endless. What to choose? How to choose? What if I make the wrong choice? Before you start doing any planning; before choosing even one piece of homeschooling curriculum stop and think about your goals. Don’t just start homeschooling by grabbing the newest, most talked about curriculum or product. Don’t choose based on what your friends are using. Start homeschooling with your end goal(s) in mind. Why are you homeschooling? What are your goals for educating your child? Answer these questions and choosing your teaching style and curriculum will be so much easier. Choosing with your end goals in mind will narrow down the overwhelming number of curricula. Do you plan to send your child back to private or public school for middle or high school? Then your goals will likely be to stay on or near grade level. A boxed curriculum or school-at-home approach might be your best choice. Is your main goal to build your child’s character? How much emphasis will be on academics vs. religious and character training? Are you trying to raise a child who thinks for himself; who knows how to figure out the answers to his own questions? Unschooling, Interest Driven, and/or Unit-Based schooling might be your answer. Is your goal to help your child graduate early, and/or attend higher education at an early age? You might be looking for accelerated or gifted learning resources. Do you want to raise a scholar and/or believe in learning for the sake of learning? Classical education might be your starting point. Do you feel that college is overrated and unimportant for your child’s future success. Will you look toward discerning and developing career interests at an early age. Possibly moving toward apprenticeship or trade school during the teen years? Maybe I haven’t listed your goal here at all. None of these goals are “right” or “wrong” but I’m betting that something speaks to you when thinking about your hopes and dreams for your child’s education. Stop now, put down the curriculum catalogs, walk away from the forums and determine the goals for your homeschool before going one step farther in planning and choosing. You may find that you have one overarching goal that is the same for each child in your homeschool. Or you may have different goals for different children in your homeschool, based on their interests and abilities. Begin schooling with the end goal in mind! Then the rest of the choices will be easier. This post is getting long, so I’ll tell you my goals in the next installment of the So You Want to Homeschool? series. What are your goals? This is such a good thing to think about from the very beginning! I come from a homeschooling family and my husband and I plan to homeschool because I loved that lifestyle. Starting with the end in mind is so important. My husband and I knew the type of schooling we wanted and what we wanted to accomplish, but it took a while to find a methodology that got us there. It involved research and quite a bit of trial and error. 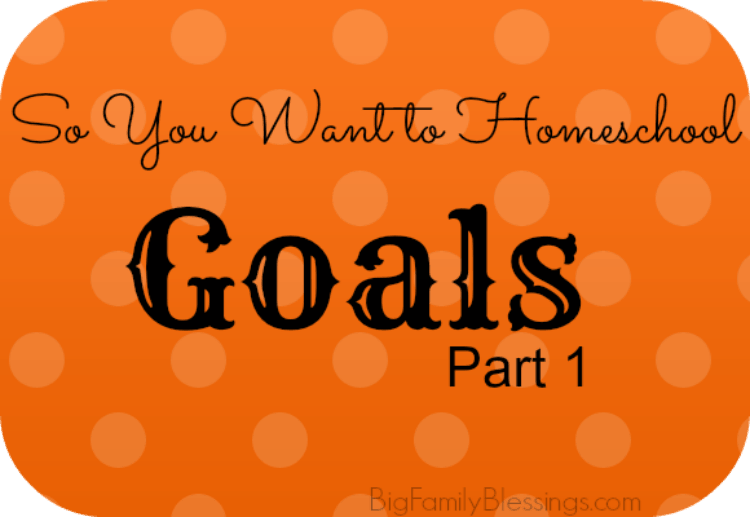 Thank you fro the wonderful post on setting goals for your homeschool.